Fermentation is the process by which yeast or bacteria consumes sugar in the absence of oxygen and gives out organic acids, gases or alcohol. Fermentation has been part of the human civilization for thousands of years. It has been used to brew beer, make bread that rises using yeast and create fermented milk which is yogurt or curd. Even though there are a lot of bad bacteria there are also a ton of other good bacteria. Our bodies themselves are host to billions and billions of these good bacteria that it needs for the body to function well. Fermentation relies on such good bacteria and it has a lot of benefits. Let me list them down for you and also tell you why fermentation is of importance to humans. Fermented food helps humans have a better gut action which means that humans can digest foods better. Also the presence of probiotics in fermented foods helps humans fight against disease causing bacteria in our body and also helps us have an overall more immune body. When the body has better gut action it can also absorb more nutrients from the foods it consumes. Also much of the work of digestion is already done for us with fermented foods and this coupled with the fact that fermentation doesn’t use heat, also makes it retain enzymes, vitamins and other nutrients that are usually destroyed if the food is processed or heated. Fermentation also releases the chemical bonds that prevent minerals like iron and especially B Vitamins from being assimilated. So in effect the nutritional value of food goes up when it’s fermented. It is known as a fact that fermented foods like salsa and chutneys tend to stay edible for longer than other foods. That is because fermentation preserves foods. You have the benefit of having foods that have the same nutritional value as raw foods but that also last longer. This makes sure that foods are not wasted and that you don’t have to buy fresh food regularly. Also vegetables like cabbage, broccoli, cauliflower, kale and turnip greens all have anticancer properties but if they are not cooked or fermented first they tend to depress the thyroid which makes you gain more body weight and also lowers your energy levels. Food preservation is such an important part of civilization as it allows people to have food reserves during food shortages and also countries that can’t import foods need to preserve foods for seasons like the winter when growing produce isn’t an option. Other methods of food preservation like adding sugar or salt, freezing, pickling, drying and distilling when combined with fermentation produces a high calorie food source in a small package that can last for years to come. Our digestive system relies on friendly bacteria in the stomach that help us break down our food and digest it. These bacteria are also found in our intestines. These bacteria rely on the process of fermentation. This means that our body needs fermentation to digest the food we intake. Without these good bacteria and the process of fermentation one cannot digest foods effectively or efficiently. As we just talked about in the previous heading about how our body relies on fermentation for digestion of the food we consume and we also talked about how fermented foods helps us digest food faster as it essentially does half the digestion for us. This nature of our body and how fermented foods work helps people with digestive disorders able to consume food better. For example, Gluten intolerant people can consume fermented wheat products, as the fermentation process would break down the complex gluten proteins and make it more easily digestible. 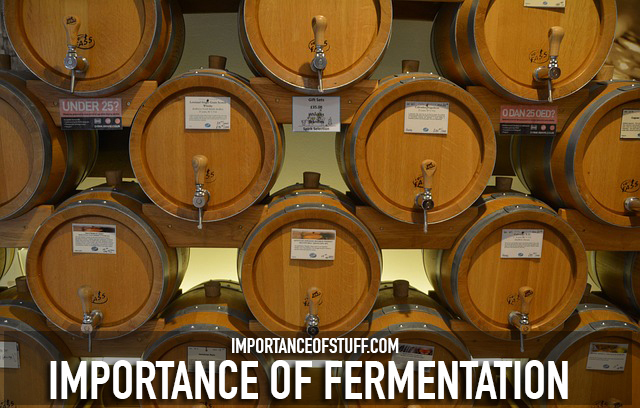 Fermentation is used for a variety of commercial purposes. Using the process of fermentation to produce consumer goods is very popular. A lot of foods such as yogurt, pickled vegetables such as pickled cucumber and carrots, alcoholic beverages like beer all rely on fermentation for their creation. Certain antibiotics and drugs also rely on fermentation for their making. For example, an important drug cortisone can be prepared by the fermentation of a plant steroid called Diosgenin, Cortisone is used to treat many different conditions such as allergic disorders, skin conditions, ulcerative colitis, arthritis, lupus, psoriasis, or breathing disorders. One of the most commercially successful uses for fermentation has been the production of ethyl alcohol. Ethyl alcohol is used in the production of Gasohol which is a mixture of 90% gasoline and 10% alcohol. A lot of cars can run on this type of fuel. Ethyl alcohol is produced by fermenting agricultural waste.